Did you ever go into a restaurant and want to taste everything on the menu? 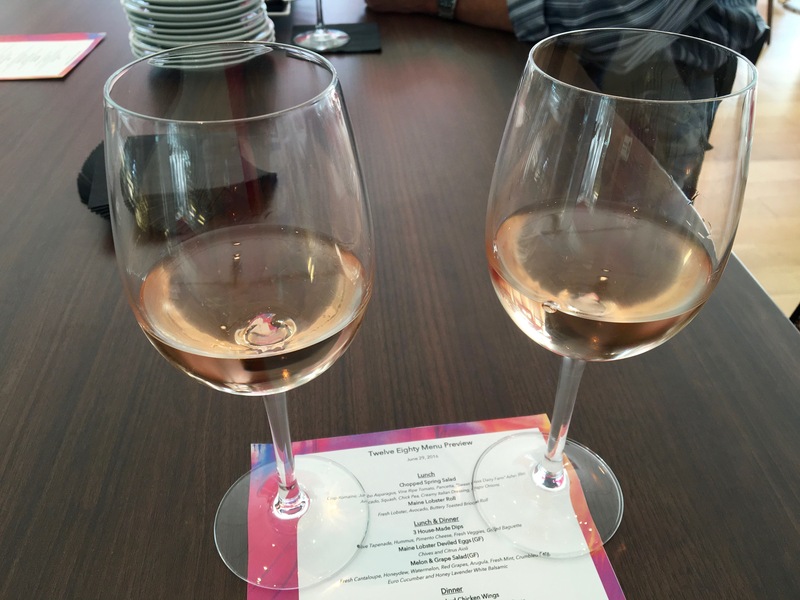 As internationally famous food bloggers (in our own minds), we sometimes get invited to events that allow us to have a little of this and a little of that. 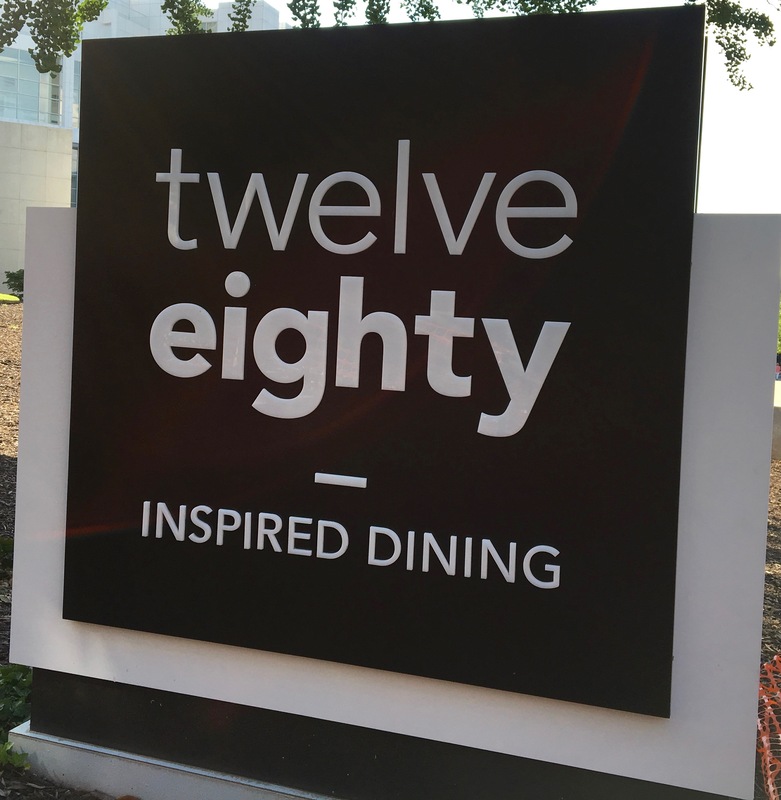 Tonight, we join some fellow “food hobbyists” to taste the new lunch and dinner menus at Twelve Eighty. Their sign says “inspired dining”. Let’s go inside to see what’s cooking. 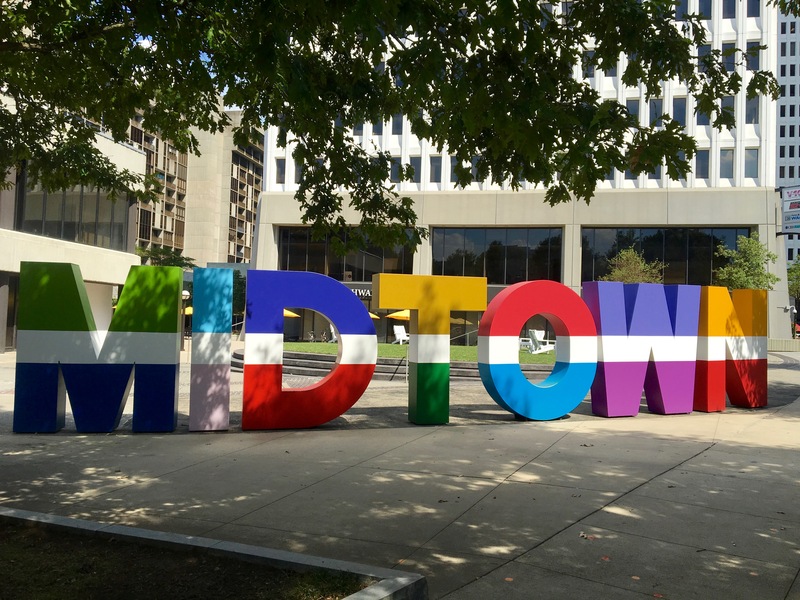 How do you like that new “Midtown” branding at Colony Square? Very colorful. 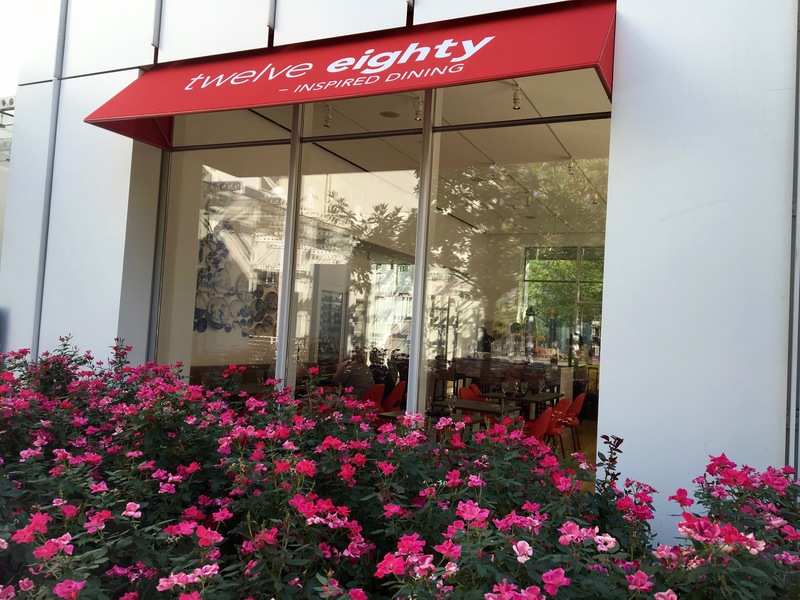 Twelve Eighty is located in the Woodruff Arts Center. You can eat here before the theatre or symphony, or pop in after a long day at the High Museum. Along with the menu, the decor is brand new. Evidently, there used to be couches and comfy chairs here, but they have been replaced with more traditional tables. They even changed the name from “Table 1280”. This is a friendly bunch. Chefs John Metz and John Barrett are here as well as General Manager Alex Polazzo. The food and drink start quickly, and once it starts, it seems like it’s almost endless. Fortunately, we each get small tastes of each dish and a few sips of each drink. We didn’t eat these huge plates of food! The menu can be described as international meets southern. It’s a hot night, and the bar begins with a crisp French rose. It’s what all of the chic ladies who lunch in France drink. The chefs start us off with a cool Chopped Spring Salad. 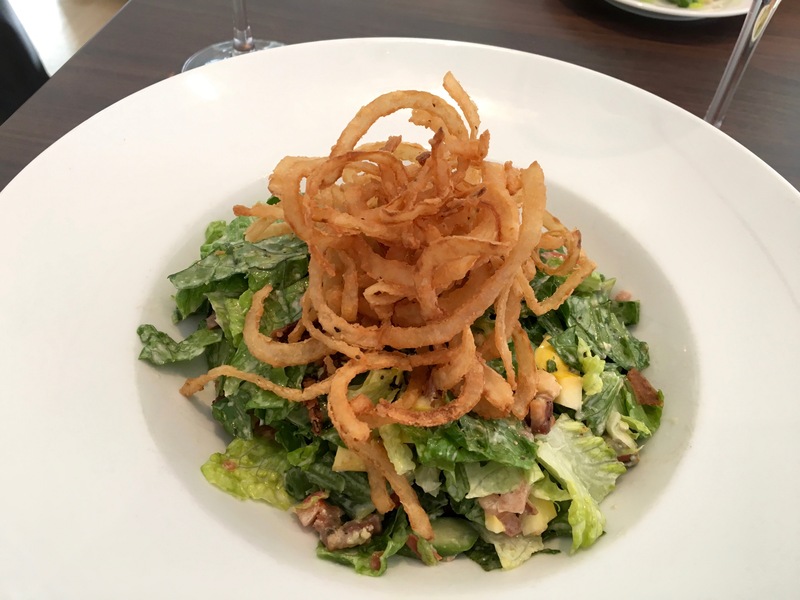 It’s crispy, it’s fresh, and we think those are Vidalia onions on top. 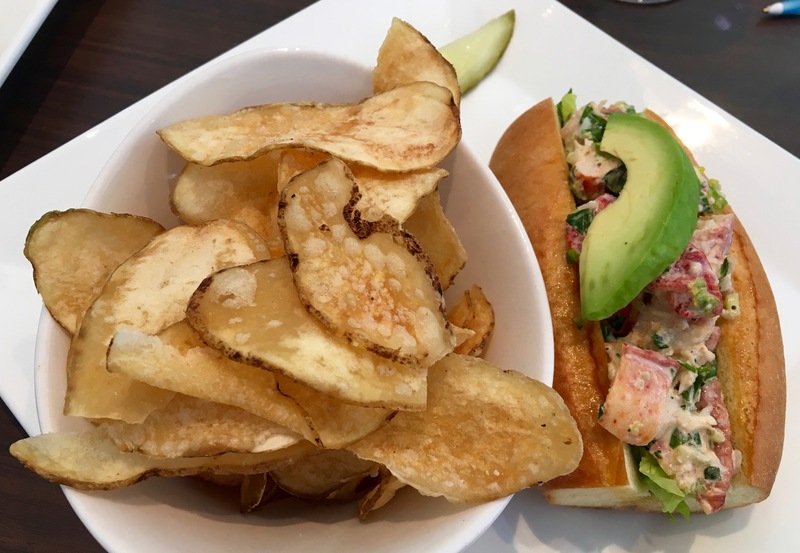 An early favorite is the Maine Lobster Roll. The brioche roll is more cake-like than bun-like. Eve really likes the house-made chips that come with it. Somehow the bowl ends up right in front of her. 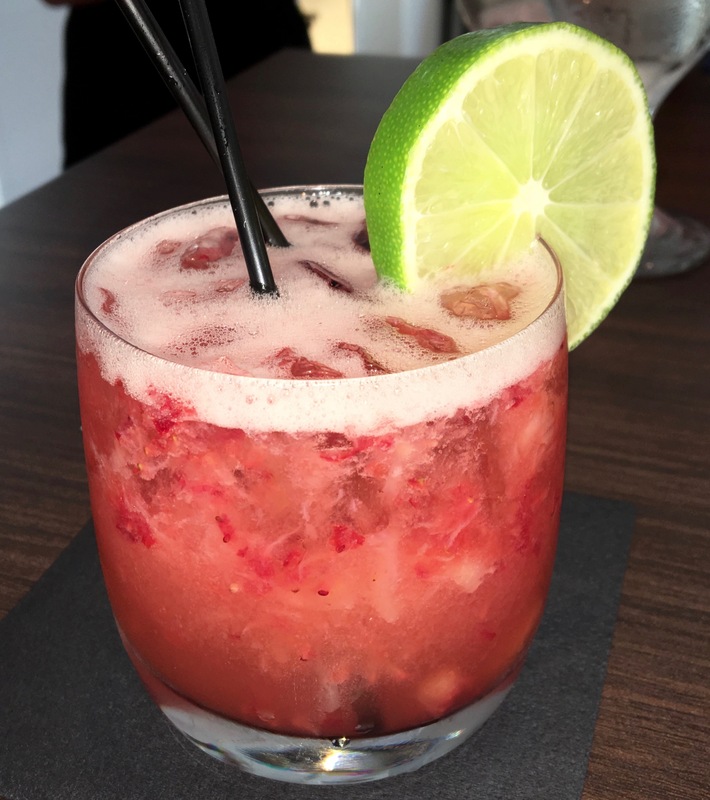 Here’s a beautiful drink, the Strawberry Caipirinha. If you can say it, you can drink it. Fresh strawberries are combined with cachaca, which is made from sugar cane and is the most popular distilled beverage in Brazil. Bet you didn’t know that. There are three different dips on this platter. 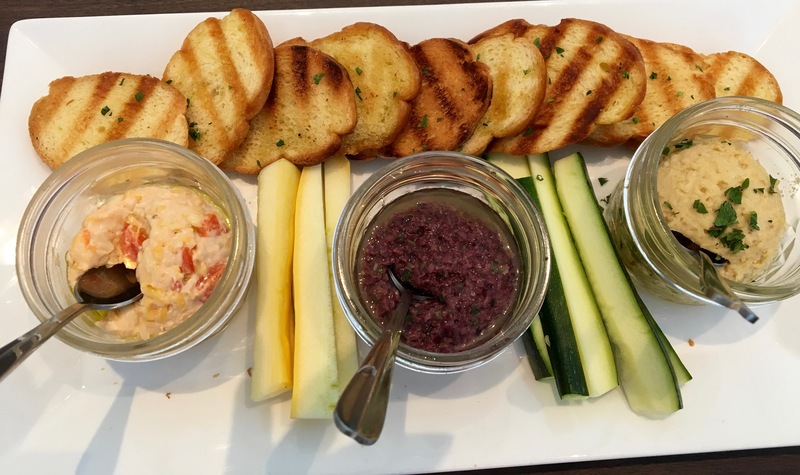 You can dip the grilled baguette or veggies into pimiento cheese, olive tapenade, or hummus. Of the three, we like the tapenade the best. Or are you a kicker? 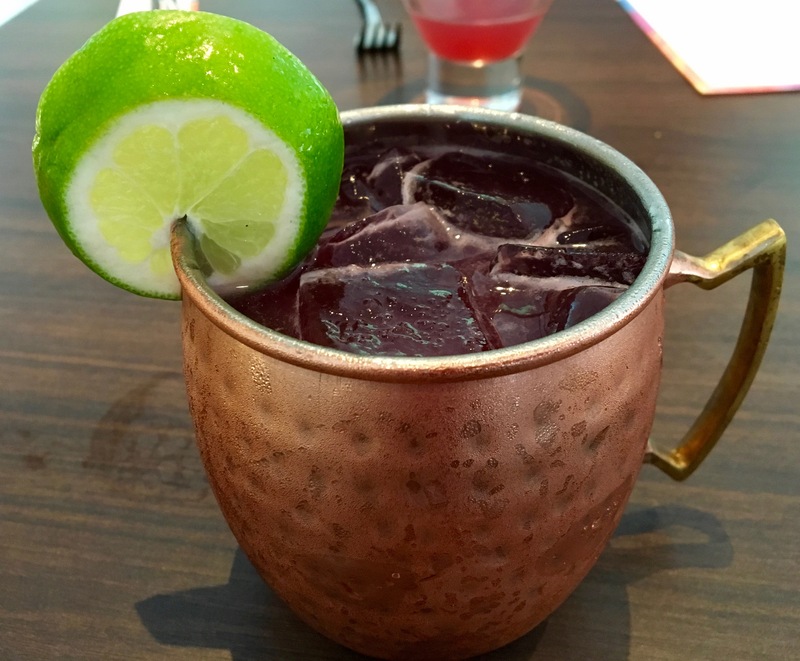 The High Kick Mule packs a wallop with its Medley Brothers Bourbon and ginger beer. We are cheap dates and are glad we only had a couple of sips of this one. If you are going to eat deviled eggs, they should have lobster in them. The lobster adds a nice flavor to this southern favorite, and it’s paired with an El Diablo. 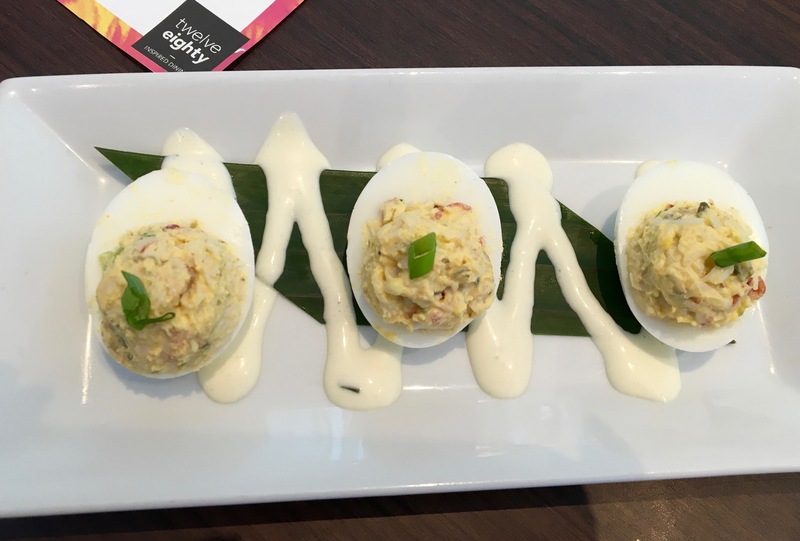 Get that deviled eggs/the Devil pairing? This one has tequila, cassis, lime juice, and ginger beer. Going south of the border, here’s the Old Cuban. 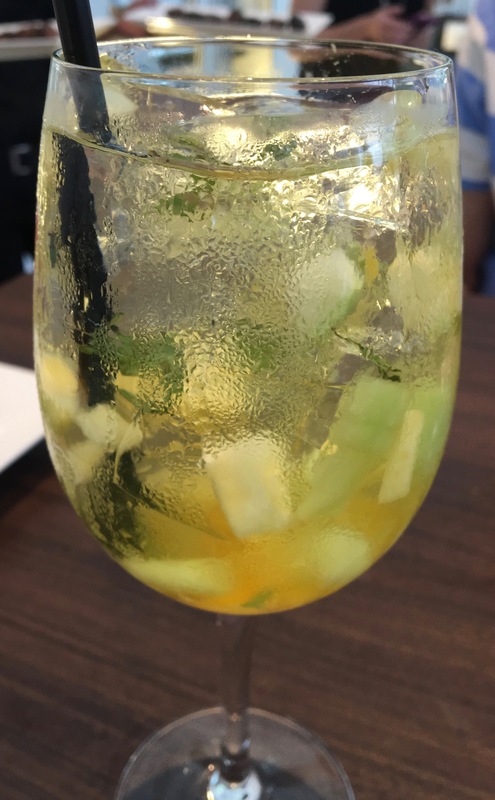 Rum and sparkling wine are combined with lime and angostura. This is refreshing and a little fizzy. Before we dive into the dinner menu, a Melon and Grape Salad comes out. You could eat this for a light lunch, especially with a big glass of sangria. The sangria comes in red or white. The little fruit pieces inside are an extra treat. Don’t go anywhere, there’s a lot more food to come. These Lollipop Smoked Wings vanished from the plate. The chefs would like to tell us the special recipe for the spices, but then they would have to kill us. We’ll just say that each one packed a spicy wallop. Ever have farro? It’s a fancy wheat grain and the star of the Farmer’s Vegetable Farro. Isn’t this a pretty presentation? 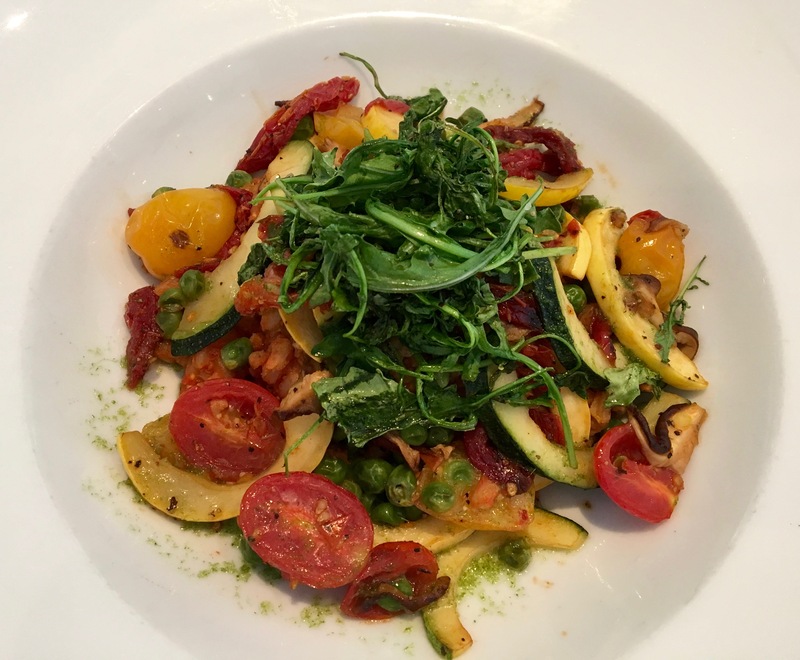 The tomatoes are especially good in this vegetarian delight. From the ocean, here are the Jumbo Sea Scallops. 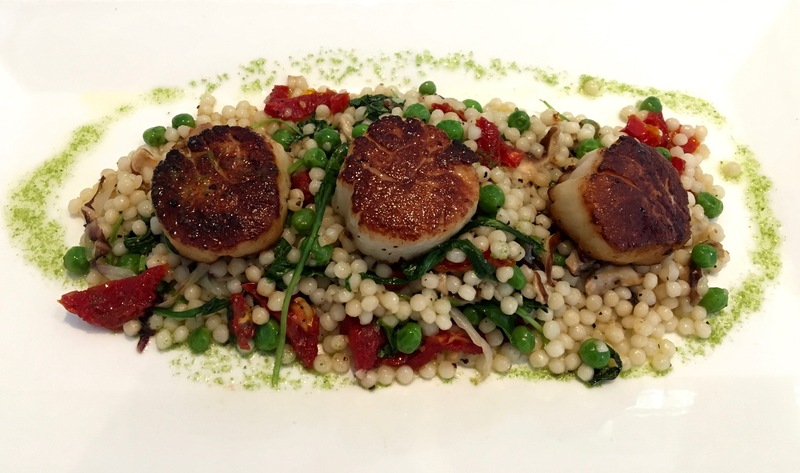 The pan-seared bi-valves sit atop a bed of couscous, peas, and mushrooms. If all scallops were this good, I would eat more of them. The last item was a big hit. 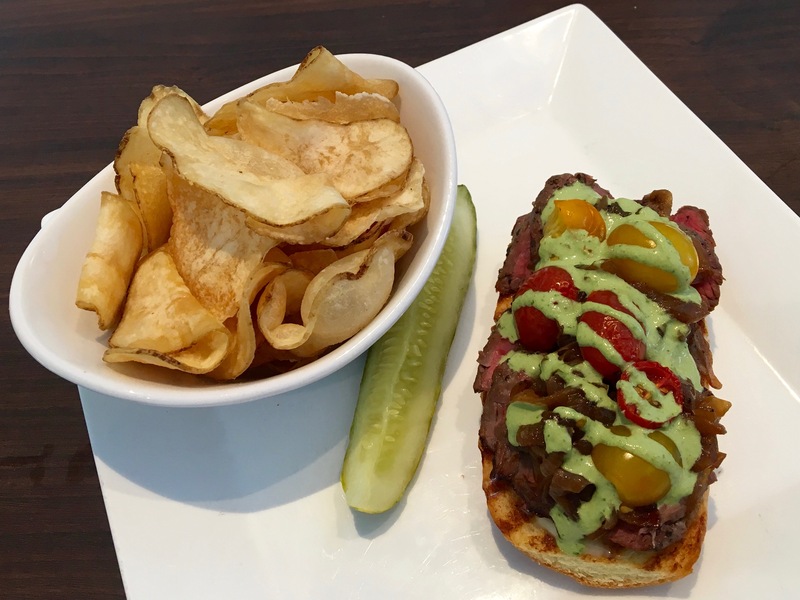 The Bruschetta Steak Sandwich comes open-faced. That’s tenderloin under the garlic aioli. We find ourselves eating extra pieces of the meat off of the plate. There’s always room for dessert. Twelve Eighty changes their dessert menus often, so you may not see these on the menu. They should serve this all summer. 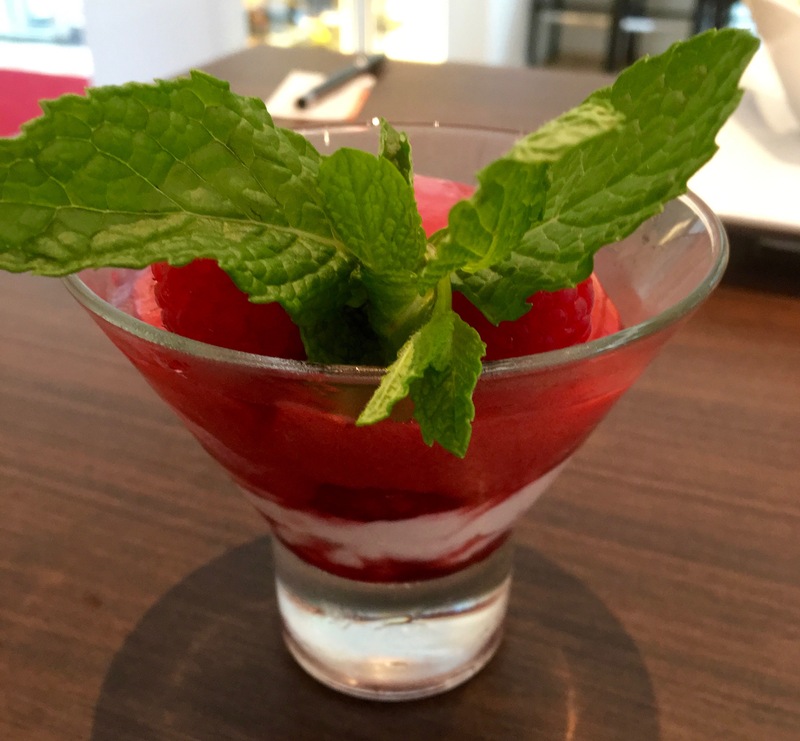 The Raspberry Creme Sorbet was smooth and fruity. We want to lick the glass when we are done, but that would be rude. 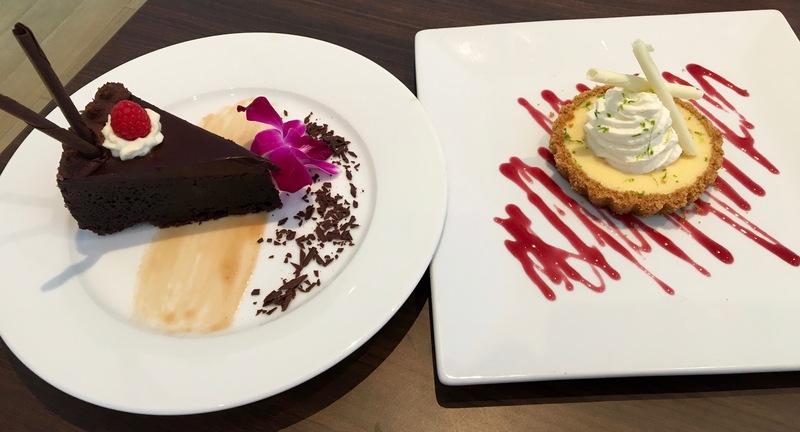 Two more desserts come out, a chocolate torte and a key lime pie. Chocolate lovers, this torte’s for you. 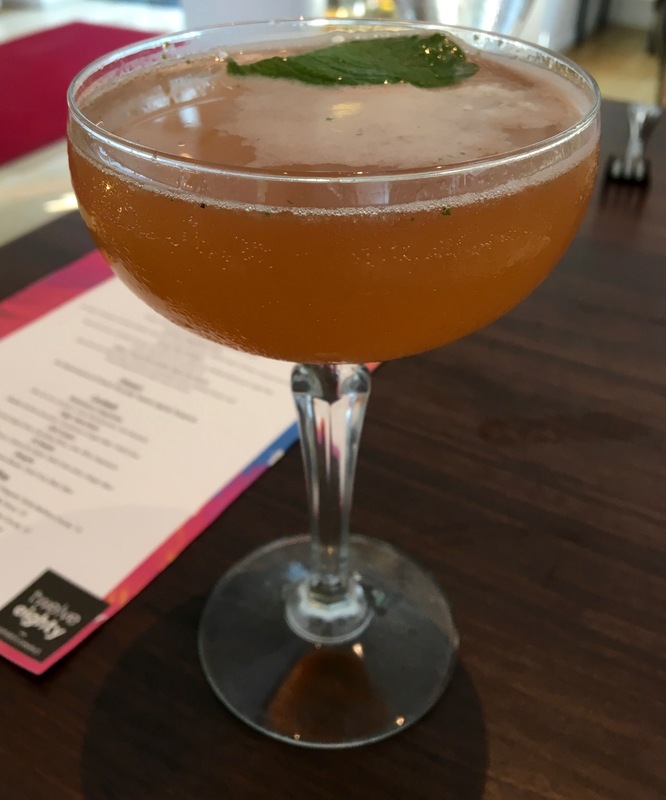 The lime pie is creamy and refreshing and a wonderful way to end our visit to Twelve Eighty. This is a very successful night. We taste nine items from the menu and six items from the bar. Add to that three desserts, and we are stuffed and very happy that we got to try Twelve Eighty’s new menu. 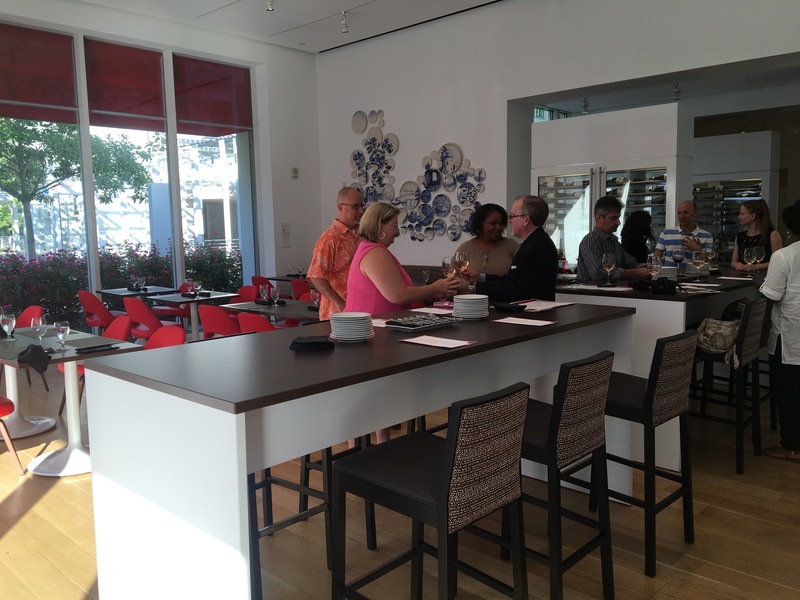 Disclosure time: As this was a media event, we did not pay for our food or drink at Twelve Eighty. Our blog post, however, is priceless. Thanks to everyone at Twelve Eighty and Sterling Hospitality for feeding us so well and for being so excited to show off their new menu. Follow Friday Date Night. Click on the FOLLOW tab in the upper right of the blog and never miss a date! I am happy they have revamped the menu. 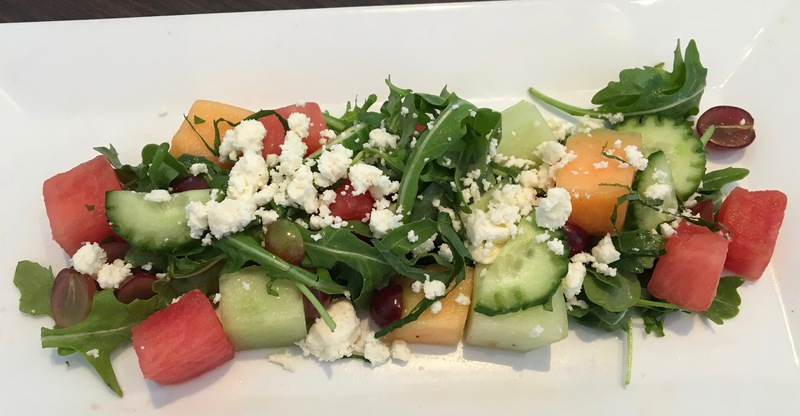 We visit the High, attend the Symphony and Alliance – want a bite to eat and have a hard time finding a good place within walking distance. Would love to know the menu pricing – from your sampling, looks like the menu could be on the “pricey” side. Hey, Mags: Entrees run from $11 for a burger to $23 for the scallops. Most are in the $14-$18 range, which makes it competitive with the neighborhood.